A while back I attended a collectors’ show in South Buffalo. I’m usually on the lookout for books and reference material about local subjects these days, although you never know what you might find at such events. The small admission charge came with a bonus – an unopened package of Topps 1988 baseball cards. And when I received that pack, I was 9 years old again for a split-second. How often does that happen anymore? I had a couple of different eras when it came to baseball cards in my life. One came naturally, with a youngster’s interest in sports. The other was surprising, with nostalgia mixed with economics. I was a huge baseball fan as a youngster in the early 1960s, collecting all the information I could on the game. One obvious and cheap source of information at that point was baseball cards. Not only did they have photographs of all the players, but the backs had their career records. How many times did I pester my parents for a dime for a pack of cards at stores? Countless. Before I knew it, I had the largest collection of cards in the neighborhood. The latest cards were sorted into teams, while the older ones were thrown into a large cardboard box. I had thousands of them, if you include football and basketball cards. The problem with that method of collection was that Topps used to manufacture the cards in “series,” meaning the first few hundred were easy to obtain but the last 132 or so were tough to find as demand fell through the summer. I had lots of cards in a given year – plenty of doubles, triples and quadruples, but no complete sets. I think that changed around 1967, when I saw an ad in the Sporting News for people to buy all the cards at once. My parents doubtless figured out that that they were being financially bled, a dime at a time, and they bought me a set. But those cards wound up in the box too, bounced around and bent. I didn’t have a way to keep them intact. Eventually, they were discarded or given away. Mom didn’t throw away my baseball cards, as many have lamented; I got rid of them myself. The annual Beckett price guide started coming out in 1979 to provide a little sanity to the marketplace, but the cards started to be used as an investment rather than as an exercise in fun for many. Plus, Topps lost its monopoly on cards, so other companies jumped into the business. Suddenly nine-year-olds were getting trained to be day traders. I bought sets in the late 1970s for fun, and kept buying them for a few years. Plastic binders that held cards had been invented by then, making it easy to store the sets. 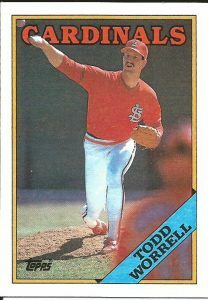 I was certainly aware that prices were appreciating, but didn’t really consider them part of my financial “portfolio.” Later in the decade and into the 1990s, card companies produced literally billions of cards. It was impossible, physically and financially, to keep up with it all. During the 1980s, I moved a couple of times. Between cards, books, sports programs, etc., I came to the conclusion that I needed a lighter hobby. The cards were the logical choice to go, and they slowly left those shelves. Some sales were done by word of mouth, others departed once eBay was created. I’m down to a couple of full sets from the 1970s, plus two coffee-table books that show the fronts of all of the Topps cards from the 1950s and 1960s. 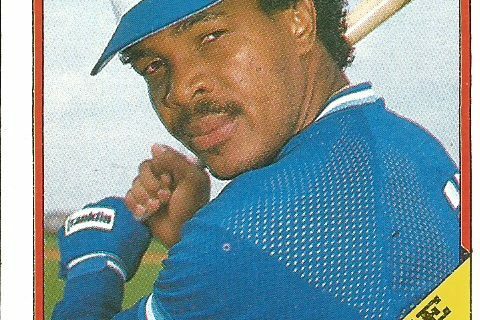 It would be a great story if I found a couple of expensive rookie cards in that package at the show – the equivalent of winning the lottery. The top first-year players of 1988 were Hall of Famers Roberto Alomar and John Smoltz in what was considered a weak year for such things. Alas, they were missing from the package. 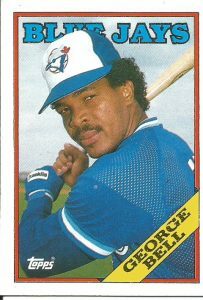 The best player in the pack was George Bell of the Blue Jays, who won the American League MVP award in 1987. 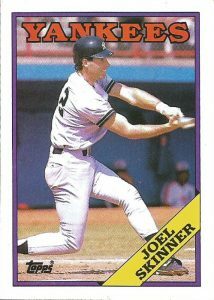 Otherwise, the cards consisted of ex-Bison player and manager Joel Skinner, Rick Mahler, Rene Gonzales, Dion James, Earnie Riles, Mark Williamson, Bob Forsch, Fred Manrique, Todd Worrell, Greg Gagne, and the leader cards for the Angels and Mariners. There was one last item in the package, of course – bubble gum. No, I didn’t chew it after it had been sitting in that package for 19 years. But the smell and the dust remained just as I remembered it, another pleasant throwback to my card-filled childhood.